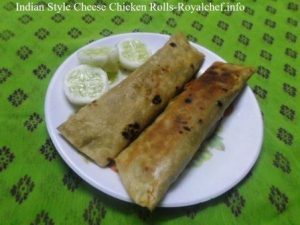 This is an easy to follow step-by-step Recipe for making at home tasty and delicious Indian Style Cheese Chicken Rolls with Green Chutney. 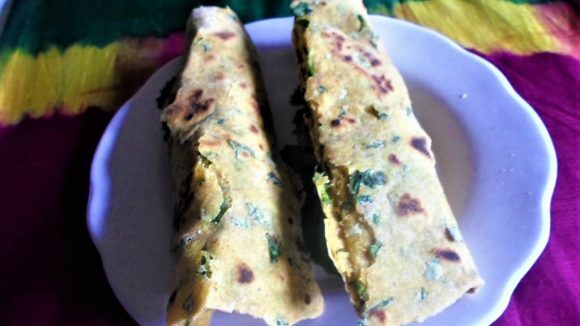 This can be a main course or a filling Chicken Snack for breakfast, which is also popularly called as Chicken Frankie or Chicken Kathi Roll. This is basically a dish of small Chicken Pieces cooked and flavored with Garam Masala and Cheese and wrapped in Chapattis lined with Green Chutney and Beaten Eggs. For the Covering: Mix the Wheat Flour, Salt, Oil and some Water to prepare a Dough. Then divide the Dough into eight equal balls. For the Green Chutney: In a Mixture Jar add the Coriander, Coconut, Green Chilies, Garlic, Lemon Juice, Salt, 2 tablespoon Water and grind to prepare the Green Chutney. Chop the Onion and Tomatoes. Shred the Cheese Cube. For the Filling: Wash the Chicken pieces and keep them aside. In a kadai add a cup Water and the Chicken pieces and cook them for 8-10 minutes on a slow flame. Then remove the bones and cut into small pieces. In a kadai add a tablespoon of Oil, Ginger-Garlic Paste, Green Chilies, Red Chili Powder, Turmeric Powder, Garam Masala, Chicken pieces, Salt and fry them for 5-7 minutes on a slow flame. Then add the Lemon Juice, Mint Leaves and mix it well. Divide the mixture into eight equal portion. For preparing the Chicken Rolls: Roll the Dough balls like a chapatti. Heat a non- stick tawa and roast the Chapatti from the both sides. Prepare all the Chapattis and keep them aside. Take one Chapatti and apply a tablespoon of beaten Egg mixture over the Chapatti on one side and roast the Chapatti slightly. Then apply the Green Chutney over the Chapatti and the spread chopped Onion-Tomatoes, Chicken mixture, Cheese and prepare a Roll. Heat the non-stick-tawa and apply Oil over the tawa and roast the Chicken Rolls. Serve hot Chicken-Cheese Rolls with Tomato Sauce.